NATIONAL League basketball was on the menu at North Berwick Sports Centre when East Lothian Peregrines met Edinburgh Kings. There was a considerable personnel gulf between the two sides, Kings having the luxury to rest star Australian forward Brett Jeffries and still have a side containing four internationalists in their twelve man squad - whilst the Ps only had seven players in total! The game got off to tense start with both teams being defensive and the Ps showing they were not going to be pushed around by their opponents. The Flockhart Brothers opened the scoring for Ps with Simon Flockhart (no relation) responding for Kings. Gavin Dunn defended well and did not allow Kings Captain Kevin Anderson any shooting opportunities. Q1 ended with the Ps leading 16- 15. There was no let-up in Q2 as the 200 local fans got behind the Ps and there was a special cheer for Sean Hume when he opened his account. Forward Peter Lyons was also playing hard at both end of the court which was proving slippy for the players due to a drip from the roof ! Commonwealth Games guard Laurie Costello was also finding his range but the Ps continued to thwart their opponents and went into a 29 - 22 lead before the Kings hit back through Simon Flockhart and sneaked ahead 30 - 29 at the interval. One disappointing feature of the first half was the ten turnovers incurred by the Ps. WHEELCHAIR Basketball side, Lothian Phoenix, recorded their second win in a row in their first season in the British Wheelchair Basketball League, Division Three (North), by beating Bolton Bulls. The match report of the game is featured in our new and exciting publication. The coverage given to all sports in The Pink2 is truly remarkable and the links to national associations and other relevant websites, such as Sky Sports, opens the door to a mountain of information and other features. Go through the catchlines on the home page and start reading all about sport, all sports, for that matter. If you enjoy sport, you will enjoy yourself totally with all that is currently featured in The Pink2. 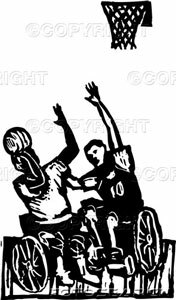 IT is not only football that is back in action with the very active wheelchair basketball in East Lothian back in full swing after the summer break. Stephen Duff is the wonderful and enthusiastic correspondent for this sport and he has contributed this match report of their opening national league game between Lothian Phoenix and Bury Blue Devils. Lothian Phoenix won this game 48-19. Stephen said: “Well, the Lothian team finally got their first long awaited season underway on Saturday against the Bury Blue Devils. Two minutes before tip-off you could really feel both a tense and anxious feeling surround the court which undoubtedly was coming from the Lothian bench. After all it was now time for this new team to put theory into practice and to keep themselves positive so that they could get that promising start the fledgling Phoenix players all wanted to ignite their inaugural season in the GBWBA Third Division North. In the first quarter both teams got off to a slow start and within a couple of minutes Lothian found themselves on the back foot with Bury’s number 23 breaking the dead lock to put his team 2-0 up. However, Michael Jordan analogies aside, it didn’t take the visitors long to get rid of those pre match nerves, answering back with a run of thirteen straight points before letting the home side deliver their second basket. In this quarter Lothian seemed to be using zoned defence which Bury found difficult to breakdown. The quarter finished 15-4 in favour of Lothian.